Dinner and drinks, a combination that goes together like… well, red wine and red meat. Whether you like to cozy up to your favorite Cabernet, sip on a classic Manhattan or partake in a fine Belgian Tripel, Jacksonville is full of restaurants that pair delicious food menus with top-notch wine, beer or cocktail lists. One of the most iconic restaurants in Northeast Florida’s fine dining scene, Matthew’s has some of the most unique (and of course delicious) menu options in the area. The elegant setting lends itself perfectly to a romantic night out. With a newly designed wine cellar that holds up to 2,000 bottles, Matthew’s extensive wine list is hand selected by Chef Matthew Medure and spans more than 10 countries. They have a sommelier on hand to walk you through your wine selection. A quiet elegant restaurant set on the Southbank of Downtown Jacksonville, offering classic continental cuisine as well as eclectic, new world dishes. 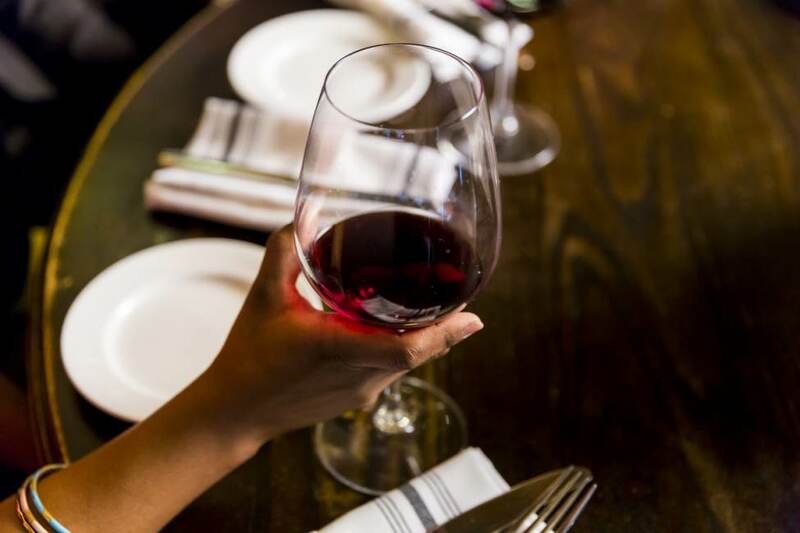 Of course, you can’t go to the Wine Cellar and not expect an outstanding wine list; theirs has repeatedly received the Wine Spectator Award of Excellence. Located in historic San Marco, Taverna offers a menu of rustic Italian dishes in a sophisticated atmosphere. Their extensive wine list highlights many fine Italian wines, as well as selections from France, South Africa, California and more. The menu changes seasonally, but you will always find exquisitely hand-crafted dishes like their house-made pasta. The perfect place to wind down with a glass of wine after a day of shopping at the St. Johns Town Center. Ovinté is well known for their terrific tapas selections, but they also offer delicious full-sized entrees like a pan-seared duck breast with chorizo and Spanish goat cheese bread pudding. Their impressive wine list features more than 240 wines that you can enjoy in their lounge or on their outdoor patio. Jacksonville has eight local breweries, all stops on the self-guided Jax Ale Trail. Zeta Brewing Co. has a casual beach vibe, where you’ll feel right at home in flip flops and a cover-up. They offer several unique beers brewed right on premises and are one of Jax Beach’s most popular spots for brunch. Engine 15 Brewing offers a tap list featuring many of their own brews, as well as other local and craft brews. They have a pub menu featuring bar favorites like the frito pie or the B-B-Cuban sandwich. Pinglehead Brewing Company is located inside of Brewer’s Pizza in Orange Park. You can pair their bold beers with a hearty Florida Smacker, the personal pan pizza that’s a local favorite. Also on the trail are Bold City Brewery, Aardwolf Brewing Company, Green Room Brewing, Veterans United Craft Brewery and Intuition Ale Works – you can often find different food trucks serving up local fare right outside these breweries. This brewpub is located in Jacksonville’s Southside and features a variety of fresh seafood, steaks, chicken, salads and pizza. On tap are their award-winning beers like the South Side Pilsner and the Iron Horse Stout. Grab some friends, your brews and some cues and play a game on their championship billiards tables. This spot is a must for any beer lover passing through Jacksonville. With more beers on tap than almost anywhere in the world (180 and counting) and a selection of 600 different bottled beers, you’d be hard pressed not to find a new, excellent beer to try. Their menu ranges from old-school favorites like Spaghettios and ramen noodles to exotic fare like lumpia or chicken tikka masala to a whole range of creative gastropub concoctions. They even offer a giant turkey leg, a crowd favorite. Open until 3am, this is a great spot for late night eats. This gastropub focuses on fresh, seasonal, locally sourced and regional cuisine. The menu changes seasonally but you’ll find southern favorites like fried green tomatoes with peekytoe crab salad or pulled pork cornbread. They have a hand-picked beer selection that features the best of local and regional brews as well as craft beer favorites like Ommegang and Southern Tier. Dedicated to using the best locally sourced and artisan produced ingredients, Moxie Kitchen + Cocktails is fully committed to the farm to table philosophy. They showcase the best of regional American fare, with a hearty southern influence. One of their most popular dishes is the Chicken + Waffles, a creative take on a popular southern dish featuring juicy fried chicken, waffle pudding, maple mousse and pepper jelly. Their handcrafted cocktails also feature fresh, local ingredients and range from classic cocktails to new inventions like the Chai + Rye (Bulleit Rye, Domaine de Canton Ginger Liqueur, Giffard Orgeat, housemade chai tea, lemon juice). Sip a fresh, craft cocktail on the rooftop bar while enjoying the views of historic Riverside, downtown Jacksonville and the St. John’s River. This modern American restaurant in the trendy Five Points district uses fresh, local ingredients in their expertly handcrafted food and cocktails. They have a killer poutine and an impressive selection of signature cocktails (the wine and beer lists are pretty great as well). Mojo No. 4 is an Urban BBQ restaurant and whiskey bar in the picturesque Avondale neighborhood. They offer your classic barbecue options like beef brisket and pulled pork, and have a mac n’ cheese that’s out of this world. They’re known for their extensive whiskey list (16 pages long!) but also worth trying is their smoked bloody mary. This Atlantic Beach fine dining restaurant features an array of sophisticated cuisine with continental influences and island inspiration. The restaurant has two establishments under the same roof. The main dining room is perfect for an intimate dining experience, and the adjacent Martini Room is one of Jacksonville’s original martini bars. They have dozens of delicious martinis to choose from, like the classic Cosmopolitan or the zesty Grapefruit Basiltini.